What Is Stone Ground Spelt Flour? While similar in look, couscous and bulgar are produced in completely different ways. 2 How Is Wheat Processed? In the United States, wheat is grown in 42 states to produce a total of 30,000 different varieties, according to the Wheat Foods Council. Out of this multitude of wheat types, bulgar and couscous can be produced using hard and cracked grains. Both of these food staples are processed forms wheat that have been produced for thousand of years. Add some variety to your diet by learning how to use these grains and incorporating them into your favorite recipes. Originally from the Middle East, bulgar wheat is also know as bulgur, alal, burghel, cracked wheat or American rice. According to the "Dictionary of Food and Nutrition," bulgar wheat is the oldest processed food known. This type of grain is prepared by soaking and cooking a whole wheat kernel before drying, removing a small quantity of the bran, and finally cracking the remains into small chunks. When used to make food, bulgar wheat is combined with water and doubles in size. Soups, salad, breads and side dishes are easy meals to make with bulgar wheat. The grain can also be used to replace rice or barley in most recipes. According to the "Encyclopedia of Food and Culture," couscous' origins can be traced back as early as 238 to 149 BC. A staple from North African cuisine, couscous is most commonly made from durum wheat, but is also made with other grains such as barley, sorghum, corn, millet or other minor grains. Production of couscous is traditionally a female activity. To make couscous, handfuls of freshly ground hard wheat are place on a hard surface and sprinkled with salt water and flour. The women use their palms to roll the grains until the couscous granules appear. Later, the couscous grains are passed through a sieve so grains of similar diameter are kept together before sun-dried and stored. 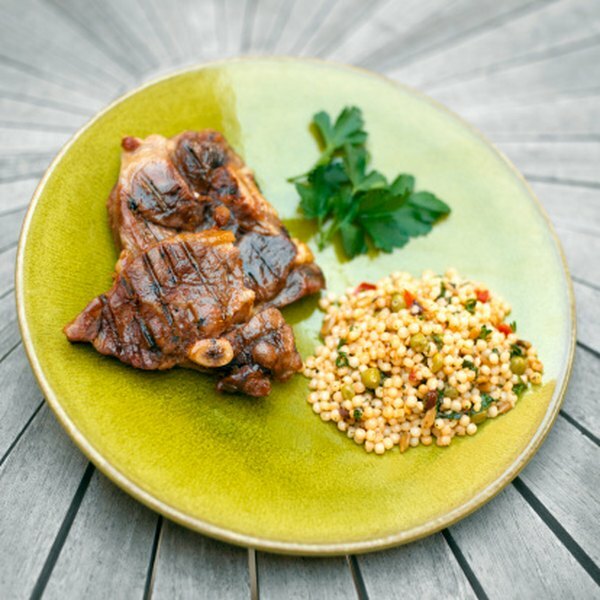 Bulgar wheat is made from cracked wheat, while couscous is made from hard wheat. The production process is also different. Bulgar wheat is made through a process that involves extraction of parts of the cracked wheat by soaking, drying and crushing the grains, while couscous is made by rolling the grains until the granules appear, before proceeding to the drying stage. The origins of bulgar wheat and couscous also differs. Bulgar wheat is traditionally a Middle-Eastern cuisine staple, while couscous is traditionally from North Africa. Once processed, both types of grain are prepared by soaking in hot water before incorporating into various recipes. Many recipes that ask for bulgar can be replaced by couscous, and vice versa. Both are also used to replace rice or pasta in recipes such as salads and soups. It's the versatility and low cost of both grains that make them popular. Marie-Pier Rochon has been writing since 2005. She has served as a writer at PlaceForPoeple and a newsletter writer for the Creative Sydney festival. Previously, Rochon also worked as a communications adviser for various Canadian federal agencies. She earned a Bachelor of Arts with honors in organizational communications from the University of Ottawa.